A new Gallup poll shows that 11% of Americans think Obama is a Muslim, and the leftist media just can't figure out why anyone would get that idea. Slate concluded that it must be because of "his exotic name and background, the color of his skin, or (most likely) some combination of the two." But in reality, the reason why people think Obama is a Muslim is because of how he acts. Why do people believe that Barack Obama is a Muslim? Here's why: after the Muslim Brotherhood won the Egyptian presidency, the military moved to curb the president's powers in order to stave off sharia rule in Egypt. But then Obama warned the military that they better hand over power quickly, or Egypt would lose billions in U.S. aid. It wasn't enough that Obama invited the Muslim Brotherhood to his submission speech in Cairo in June 2009, despite the fact that the group was banned at that time for obvious reasons: they wanted to install a sharia government, and the draconian, barbaric code of sharia, in Egypt. It wasn't enough that after he invited the Brotherhood to his speech; he had officials in his administration meeting with this Islamic supremacist group. It wasn't enough that he abandoned the true freedom movement, when the women of Iran and Persians and Zoroastrians rose up after 30 years of oppressive sharia rule. Obama spit on them and left them to die. They met bullets with bare flesh and broken bricks. It was a squandered historical moment: by supporting the demonstrators in Iran, Obama could have done much to remove the head of the snake of Hezb'allah, Hamas, the Shi'ites fighting American soldiers in Iraq, the Taliban in Afghanistan and Pakistan, and the Shia agitation in Bahrain. Obama could have saved the free world and gone down in history as one of the magnificent heroes for good. But that is not who he is. He is a tool, a malevolent subversive who managed to seize the most powerful office in the world with the PR expertise of the enemedia. Obama's war on the good continued. It wasn't enough that he abandoned Mubarak, our 30-year ally in Egypt, the first Muslim country to make peace with the Jewish people despite the Jew-hatred mandated in the Quran. It wasn't enough that he threw our great friend and ally out with both hands, a man who for all his undeniable faults was the most liberal of reformers in the Muslim countries in that region. And here we are with the Brotherhood victorious, and what does the leader of the free world do? He threatens to withhold all U.S. aid to anyone who stops the Muslim Brotherhood from taking power. Does he threaten to withhold aid from the Muslims in Gaza who daily talk about their desire to destroy Israel and annihilate the Jews, and who glory in the murders of young families with their children, and lob rockets into civilian areas so that the people there have to live in terror going to work and to school? Of course not -- he increases the aid to the annihilationists who thirst for genocide in their mad Islamic Jew-hatred. And the media wonders why so many people think Obama is a Muslim? Obama has banned the word "jihad" and any discussion of Islam from State, Defense, and Justice Department vernacular and counter-terrorism materials. He is denying that jihad is the enemy, while his Justice Department acts as the de facto legal arm for Muslim Brotherhood groups in America. And the Obama administration has held hundreds of meetings with U.S. Hamas front groups. Obama is withholding evidence in the Fort Hood jihad that has held up the court case of the single worst act of war on a military base in U.S. history. The Obama administration refers to the Fort Hood jihad as "workplace violence." The trial of the Fort Hood jihadi (who was screaming "Allahu akbar" as he mowed down 13 U.S. soldiers) has been delayed repeatedly because Major Hasan came in sporting the religious beard of the devout Muslim. The appeaser-in-chief excoriates America for Guantánamo, which provides its enemy combatants with Korans, laptops, duck à l'orange, and my, oh my, the inhumanity of it all. He flogged and beat us with his wet waterboarding noodle. He cried for Khalid Sheik Muhammad's nose -- despite the fact that the enhanced interrogations saved the lives of thousands in Los Angeles. Three mass murderers were waterboarded (along with scores of CIA and military folks), and Obama was shocked, shocked, I tell ya. Obama has made several Muslim Brotherhood appointments to key high-level, sensitive positions. Obama has told us time and time again that "we will never be at war with Islam" (even if Muslims are at war with us). He has removed the sanctions covering religious freedom from the State Department's Country Reports on Human Rights -- and it just so happens that the worst offenders against religious freedom are Muslim countries. In June 2010 I wrote an article containing a long list of the things Obama had done since becoming president that made people think he was a Muslim. I wrote: "Obama took an oath to protect and defend the Constitution, and yet whether he is a Muslim or not, he has undeniably gone around the world promoting Islam and Sharia (Islamic law)." Since then, he has continued to do so. 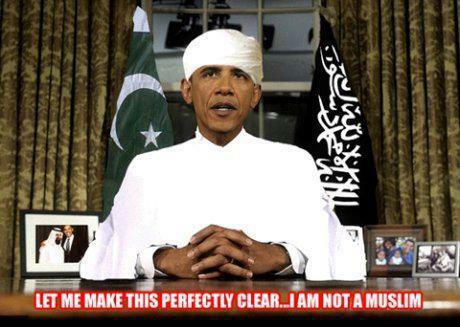 He keeps fueling the impression that he is a Muslim by his actions, which have been consistent. He killed Osama and Awlaki? Sure...but he has never moved against pro-sharia Islamic supremacists. Quite the contrary. By their fruits ye shall know them, and so we know him. The left media should stop beating people up for being logical.